copyright changes look interesting, but why just ‘datasets’? – the one aspect of the ‘dataset’ changes that looks potentially useful is the requirement to allow re-use of disclosed datasets in line with a licence which will be stipulated under the s.45 Code of Practice . This has the potential to clear up the issue that @copyrightgirl commented on in her posts here and here on the blog in recent weeks. But why restrict this to ‘datasets’? If they made provision for re-use of all disclosures, it would resolve the tension between FOI and copyright law for good, especially in relation to things like WhatDoTheyKnow. Publication Schemes – req to publish datasets disclosed. Why not all disclosed info? There are some interesting proposals in terms of Publication Schemes, but again they focus on ‘datasets’. Basically it appears to be introducing mandatory disclosure logs but only for disclosed datasets. Why not make it mandatory to publish all disclosed data? Would help FOI Officers who have been battling for years to get Disclosure Logs past IT managers and web masters who think they upset their nice web design. Gets rid of loophole for companies set up by 2 or more public authorities – good. 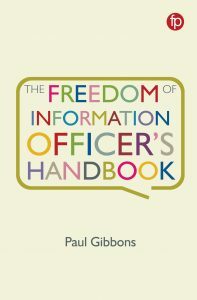 Martin Rosenbaum of the BBC has commented that he thinks the Bill introduces more freedom for the Information Commissioner in procedural matters – not sure I got that, but may well be true. So overall, nothing really to write home about. Except I have. One to keep an eye on I think. Emily Goodhand, Twitter’s @copyrightgirl, returns with her second guest post for FOI Man. There’s been a lot of interest and discussion around the government’s Open Government Licence and whether it covers information released under FOI. In short, it does not. The Open Government Licence (OGL) allows others to re-use information which has been made publicly available (i.e. on the public facing web) by a government authority so that individuals wishing to make use of this information do not constantly have to write for permission to do so. It is important to note that not all public authorities have adopted this licence, and that the licence only applies to works which have been published. Any information received by an applicant under FOI will not automatically fall under this licence, and therefore permission would have to be sought via a request to re-use this information before further use (including reprographic publication) could be made. Why would a Public Sector Organisation be reluctant to apply an Open Government Licence to information released under FOI? It is important to take these concerns into account in order to get a fair and balanced view of why, at times, a public sector organisation may not allow re-use of information in certain ways. A request for re-use of information can be submitted to the remaining authorities who are not excepted from the regulations at the same time as an FOI request. The FOI request will be dealt with first, as re-use of information is impossible if access to that information is not granted. It is up to the institution as to whether it chooses to grant re-use of the information supplied, and it is entitled to make a charge for the re-use of the information. Complaints are handled by the Office of Public Sector Information, and more information about the re-use of public sector information is available from the National Archives. The CDPA makes certain allowances for the use of work without the need to request permission to use it from the copyright holder. The main defence is fair dealing with a work for the purposes of: a) non-commercial research and private study; b) criticism and review; c) news reporting. It should be noted that photographs are specifically excluded from the fair dealing defence for the purposes of news reporting. The emphasis in the Act is on the word “fair” – although it is not specifically defined, various case law has indicated that the work used must be no more than is necessary to make the point (i.e. an insubstantial amount) and must not have a detrimental economic impact on the original work. In addition to this, other factors also come into play, such as whether the work is published or unpublished, what the motive was for the dealing, and whether the purpose could have been achieved by different means. The defence, if relied on, should be used carefully, as one court found the copying of as little as 11 words to be copyright infringement. However, it is generally accepted that journalists can rely on this defence to re-use insubstantial portions of the information they receive as a result of an FOI request for the purposes of news reporting, with the exclusion of photographs. FOI & Copyright: What’s the Big Deal? There’s been a lot of confusion recently over FOI as it relates to copyright law. Decision notices such as the one served on the House of Commons have only managed to confuse the issue further, with copyright law now being viewed by many as merely another excuse to withhold access to information. However, the Copyright, Designs and Patents Act 1988 (CDPA) is a valid and relevant piece of legislation which applies to a sweeping majority of work created in the UK. 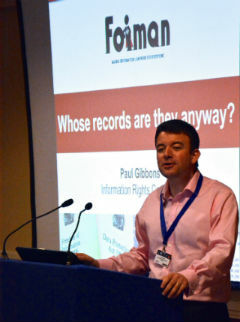 As information is increasingly delivered via digital means, copyright issues must not be dismissed as irrelevant or insignificant in light of an FOI request. Copyright applies regardless of whether a work counts as public information or not. Unlike in the USA, where work prepared by an employee of the US government as part of their official duties is not protected by domestic copyright law, work created by employees of the UK government attracts Crown Copyright protection. Crown Copyright lasts for 125 years from the year in which the work was made, unless it was published commercially within the first 75 years, in which case copyright lasts for 50 years from the date of commercial publication. The question arises: what exactly is “specifically authorised” by the FOI Act? Firstly, the Act is for the disclosure of information to one person, “the applicant”. Section 11(1) details the ways in which the applicant can express a preference for how the information is communicated to him or her: a) a copy of the information in permanent form or another form acceptable to the applicant; b) the provision of a reasonable opportunity for the applicant to inspect a record containing the information; and c) the provision of a digest or summary. The key here is that the making and provision of a single copy of the information to an individual applicant does not infringe copyright. In essence, if the document contained graphs, tables, photographs, diagrams, and so on created by others outside of the public authority (also known as third party content/copyright), the authority would be able to supply a copy of that document in its entirety to the applicant without having to seek permission to do so from the various copyright holders represented. However, the FOI Act also states that in deciding whether the making and supply of a copy is ‘reasonably practicable’ the authority may ‘have regard to all the circumstances’. 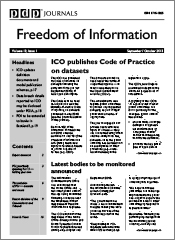 If one of the circumstances is that the information being supplied will immediately be available for many people to download, view and copy on a website (in other words: be published), this does not fall under what is “specifically authorised” by the FOI Act and therefore section 50(1) of the CDPA no longer applies. In the HoC Decision Notice, the Information Commissioner declared the What Do They Know? website’s email address valid for the purposes of the FOI Act, and therefore under this Act the HoC was required to release the information. However, the copyright issue arose not with the disclosure of the information itself, but rather with the issue of instant publication to the website of that information. This issue was deferred by the ICO (and rightly so) as being outside of their scope. The only problem with this is that it would really require the judgement of a court to state that the act of instant publication of information disclosed to an applicant under FOI is not “specifically authorised” by the Act and therefore section 50(1) of the CDPA cannot be applied, meaning that such use of the information infringes copyright. Emily will be back next week to talk about ways to legitimately re-use information disclosed through FOI. Quick post to inform you of an exciting development for the FOI Man blog. For the first time, I’ve invited someone to write a guest post. Next week I’ll be bringing you the first guest post from Emily Goodhand who Twitter followers will know better as @CopyrightGirl. Emily works for a university on copyright compliance issues and has her own blog on Education and Copyright. She recently featured in The Times’ list of best legal tweeters (behind the paywall unfortunately). Her posts will focus on the interface between FOI and copyright law. So watch out next week for Emily’s first post for FOI Man.